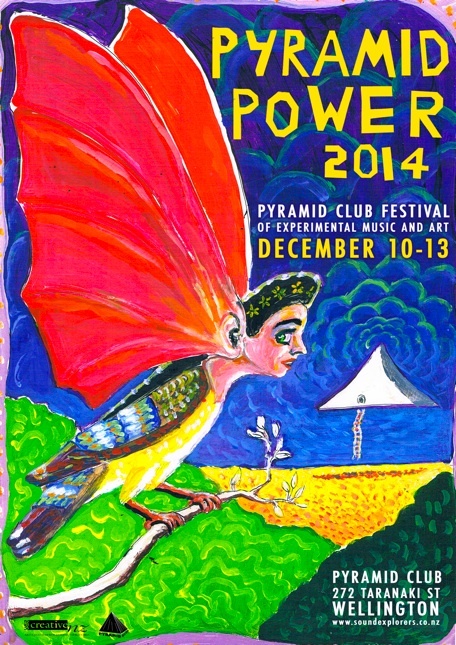 The SOUND & LIGHT EXPLORATION SOCIETY is pleased to present PYRAMID POWER!!!! A four day spectacular of MUSIC and ART of staggering proportions!!!! Sound experiments, psychedelic jazz, hotwired synths, free improvisation, noise, experimental films, and more! Continuing in the grand tradition of the Wellington music festivals Off the Deep End, Bomb the Space, Rising Tides and Fredstock, Pyramid Power celebrates Wellington’s proud of history of musical eccentricity. And we’re happy to bring artists from around New Zealand to town for the festival! Exhibition Opening & festival opening event! Lady Lazer Light is well known around NZ for her experimental live visual work with acts including All Seeing Hand, Sign of the Hag, Orchestra of Spheres and many many others. Her installation work is stunningly inventive. Utilising found objects, home made machines and backyard chemical reactions, she invites viewers to step inside an expanded version of her own inner world. Experimental violinist Tristan Carter teams up with seriously inventive percussionist Takumi Motokawa and musical saw player Sara Passmore, recently returned from London. Amber Johnson’s dark electronic pop. Gerard Crewdson is an artist of rare abilities who uses painting, music, story telling and his homemade cardboard cinema to conjure up dark psychological dramas set in worlds awash with pure abstract beauty. His work adorns the covers of countless albums, books and posters (including this festival’s poster). He’s creating a special opening performance to get the Pyramid Power Festival underway, and is joined by some of NZ’s underground greats, Jeff Henderson, Kieran Monaghan and Kraus. All Seeing Hand frontman and throat singing maestro Jonny Marks’ new large ensemble with choir, clappers & strings. and he might meet his match with vocalist Atsushi who digs extremely deep to deliver his unique style of sound poetry. Experimental film-maker NA Royal’s work focuses on the computer and the methods and processors used by the medium, time, space, sequence, repartition etc. in an attempt to discover new sound and imagery. Rosie Langabeer has spent the best part of 5 years in Philadelphia, playing and writing music for theatre and getting involved in the city’s creative music scene. Nell Thomas plays drums, synth, theremin, gamelan, flute, clarinet and vocals in Cookie Brooklyn and the Crumbs, Orchestra of Spheres and other groups. Psychedelic free jazz with some of Wellington’s finest. Stretched out samples, slackened tapes, scraped metal percussion and woozy field recordings on warbled tape players. Auckland’s Kraus is an underground legend, DIY synth maker and founding father of groups such as The Futurians, Olympus and Maltese Falcons. A potentially explosive mix with fellow synth strangler Simon O’Rorke and drummer Reece McNaughten. A selection of surrealist songs by ‘Noise Abatement Society’ member and Scottish absurdist poet/song writer Ivor Cutler. Guitarist Greg Malcolm is familiar to NZ audiences for his solo prepared guitar performances, using guitars with both feet and hands and a commercial kitchen’s worth of cutlery between the strings. For this set he’s playing ‘normal’ guitar and is joined vocalist Jenny Ward, Hermione Johnson (organ) and Jeff Henderson (sax). Jo Contag (Golden Awesome) and Alphabethead melting turntables and scrambling electronics. Masked duo of Auckland enigmas. Raw drum grooves and organ riffs. Critically acclaimed heartthrob ‘Franky’ is the sensual force behind this world-renowned solo act. Greg Malcolm and Jenny Ward present a magical musical journey of sounds, songs and stories for kids. Children will be drawn into world of musical mischief and mayhem… they’ll meet some exciting characters along the way including a spider, a bee and a ladybird. They will hear and see classic folk stories told on felt boards over a bed of adult friendly music. A gentle and beautiful approach to children’s music and art. and Jenny Ward, a singer with a background in theatre and a school teacher on the side. witnessing a perfect solo ballet of mini-cassettes, modified guitar, foot-pedal drum-kit & short-circuiting spring reverb croon. Outsider songwriter and video artist, sometimes noisy & electronic & abstract and other times more acoustic with songs, David Edwards has been based overseas for the past 5 years. Prepared piano played with intensity and precision by Auckland-based pianist Hermione Johnson. Chris Prosser is a violinist of extraordinary talents who has written dozens of studies for scorditura violin. Simon O’Rorke is a stalwart of the Wellington improvised music scene, playing percussion and synths. Brass, reeds and vocal chords by three of NZ’s best creative musical minds. Outsider dream pop from the ex-Christchurch, ex-Hong Kong, now Coromandel based sister duo of Clementine and Valentine Nixon. Esoteric, guitar-led dreamscapes and angelic vocals… the two have recently been touring with Ariel Pink though the US and Europe. A hawkland city rock band. Metal birds falcons of fate: Kraus, Stefan Neville, Ducklingmonster, Sean O’Reilly. A veritable all-star lineup of the NZ psych underground. Uncannily groovy keyboard and midi guitar duo of Ian Downer and Julian Taylor. He’ll be performing his solo one-man-band act : live finger beats, foot thumping, twanging, moaning, hard out riffs, dodgy singing, casio boogaloo, sound fx to the maximus + heeeeaps more. 3x electronic vocals by Samin Son, Noel Meek and Fergus Moores with Pseudoarcana label boss Antony Milton taking on drum duties. Door sales only – tickets are limited. Shows start pretty close to the advertised time. This entry was posted in 2014, New Zealand and tagged Dave Edwards, New Zealand music, Wellington.